The Orinoco River is one of South America’s longest rivers with a length of 1330 miles. It originates from the Sierra Parima Mountains and flows through Venezuela and Columbia and eventually empties into the Atlantic Ocean. The main tributary to the river is the Apure River. The name Orinoco has been derived from Guarauno words meaning ‘a place to paddle’. The drainage basin of this river is known as Orinoquia. It is estimated to be between 880,000 and 1,200,000 square km. The mouth of Orinoco River was found by Christopher Columbus on August 1st, 1498. There is a natural canal named as Casiquiare that joins the Orinoco River and the Amazon River. There are more than 1000 species of fish living in the river including piranha and electric eels. This river’s basin has mineral deposits such as iron ore, nickel, bauxite, manganese and many more. 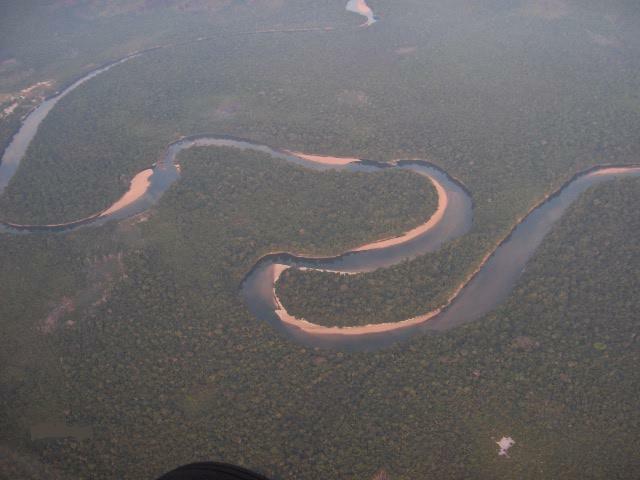 Geographically, this river is divided into four stretches which are upper, middle, lower and Delta Orinoco. It is the only habitat to see the Orinoco crocodile which is one of the longest crocodile species. It is also home to various bird species including parrots, flamingos and scarlet ibis etc. The average depth of the river is 165 feet during the winter season and 49 feet during the summer season. The Orinoco Belt is the world’s largest certified petroleum deposit. Declan, Tobin. " Orinoco River Fun Facts for Kids ." Easy Science for Kids, Apr 2019. Web. 18 Apr 2019. < https://easyscienceforkids.com/orinoco-river/ >.